You may need new windows to update your home, increase its value and save energy costs. There are several indications that it is time for new windows. You have old single glazed windows. Air is seeping into the house even when windows are closed. Your power bill is higher. You have noticed a glass crack or pits in a window. Some windows frames or sashes are broken or metal frames are bent. Broken windows are dangerous. Taping the cracked or broken area is a temporary fix until the window can be replaced. A broken window can shatter and hurt someone. The window replacement cost may be covered by homeowner insurance if it was the result of an accident. Broken or split window frames and sashes may be repaired but the glass should be replaced to insure a good fit and save energy cost. It may easier to replace the entire window with a new frame. The Sacramento area is hot during the summer, but cold in the winter. You probably keep your windows closed and the heat on from November to March or April. Single pane windows do not hold in the heat as well as double-glazed windows. A double-glazed window has a tiny pocket of air or argon gas between two sealed panes to serve as insulation. This will hold in cool air during the summer and cut down on your air conditioning and winter heating costs. The Low-E coating on new windows reduces glare and UV rays while allowing light into the room. Installing new windows is a job for professionals. Straight Line Construction is experienced with window installation in homes and commercial buildings. Our trained estimators will discuss window replacement cost using the windows that meet your needs. Double-glaze energy efficient windows from Andersen offer excellent solar protection to prevent carpet and furniture from fading. The windows use reclaimed and recycled materials including 12% reclaimed glass and 40% reclaimed pre-consumer wood. Windows come with an owner-to-owner limited warranty if you decide to sell your home. 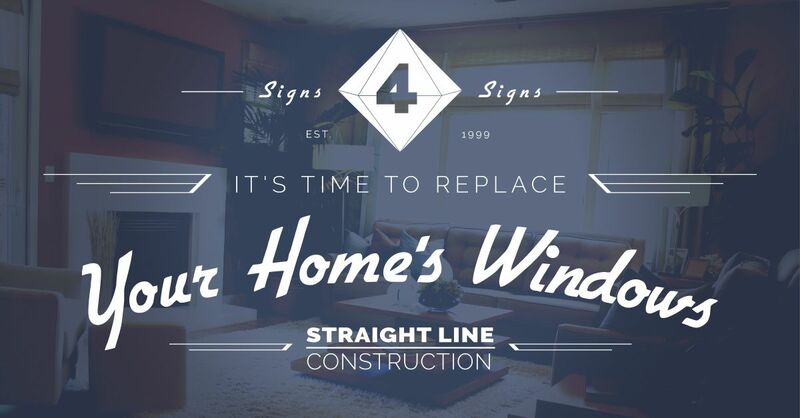 Contact us at Straight Line Construction for more information on our services and products. Stop by our showroom at 3811 Dividend Drive in Shingle Springs. Read: What Type of Windows Should I Buy?